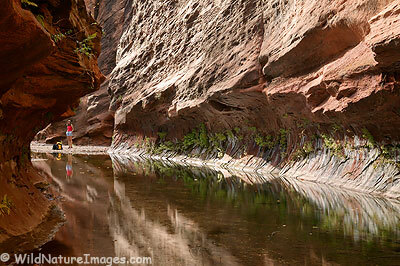 Janine on the famous West Fork of Oak Creek Trail, near Sedona, Arizona. About this time last year, we hiked this well known trail. 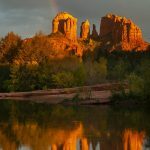 You wouldn’t think of Arizona when you think of Fall colors, but this trail is an exception – West Oak Creek has wonderful Fall colors in combination with tall, steep red rock cliffs, a photographers paradise! The official Coconino National Forest trail ends about three miles from the trail head, but it is well worth going further even though you need to do some scrambling and get a little wet. The best scenery and few people are beyond the official end. Here I’m looking back toward Janine, this was about as far as we went on this particular day as the water does get fairly deep and cold past this point. To find this trail, take highway 89A out of Sedona toward Flagstaff to the “Call of the Canyon” parking lot about 10 miles from Sedona. There is a fee booth at the entrance to the parking lot and during the fall it can be full before mid-day, so you may want to get their early. From the parking lot follow the signs to the trailhead. One year we were here during a winter snowstorm – the area looked vastly different from fall, but was equally as beautiful. Tomorrow I will post a photo showing some of the fall colors along this trail. 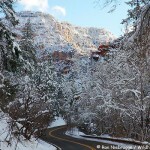 Here are more Sedona Arizona photos. Looks like a wonderful place to explore!